Forever Active Pro-B is a small, easy-to-swallow beadlet that helps overcome imbalances created by our food and lifestyle choices, which can inadvertently lead to a reduction in the amount of naturally occurring probiotics. Promotes a healthy digestive system. Enhances nutrient absorption and immune function. Unique combination of 6 beneficial strains of microbes. Microbes are live microorganisms that exist in our bodies and play a role in our general health and well being. While some microbes are bad, the majority are beneficial. These "good bacteria" are called probiotic , meaning "for life' in Greek. Forever Living Products recognizes the important role that beneficial microbes play in human health and the need for probiotic supplementation. Forever Active Pro-B is the only shelf-stable, 6-strain probiotic on the market today that requires no refrigeration. And what’s great about it, is that it works in tandem with Forever Living's patented stabilized Aloe Vera, which acts as a "prebiotic", which fosters the growth of and provides the ideal environment for the probiotic to function. Forever Active Pro-B works primarily in the intestines where it assists with the process of food digestion, helping to release nutrients for absorption, and contributes positively to normal human growth and development by helping to maintain a balanced and healthy system. As probiotics themselves are quite fragile, Forever Living Products uses an exclusive, patented encapsulation technology that protects the probiotics, and releases the unique combination of the six beneficial strains of microbes only after they reach the desired destination into the intestines. 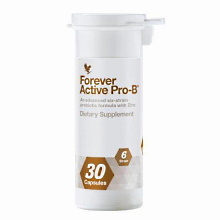 So whether your goal is to promote a healthy digestive system or enhance nutrient absorption and immune function, add Forever Active Pro-B to your daily supplement program. Take one beadlet daily with water on an empty stomach or two hours after a meal. Store below 80 degrees Farenheit (27 degrees Celcius) for best results. This product contains natural ingredients, so color variations are normal.